The approval of the esteemed Vogue magazine and a dazzling array of colour choices go quite some way to making these versatile Trasparenze Cinzia Microfibre Knee High the socks of choice for the fashionable on several continents. 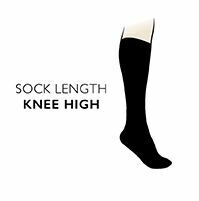 With their 70 denier thickness, these opaque microfiber knee highs can baffle chilly breezes without weight or bulkiness. The slight sheen, block colour look and attractive, distinctive rib comfort tops look stylish with shoes and sandals, or perfect under pants for a dash of colour at the ankle.